The little Chipping Sparrow is just another common LBJ (Little Brown Job) that we hear all the time and often see flitting around the ground and shrubs but can’t distinguish from all the other LBJs doing more or less the same thing. Although passerine just means “little sparrow” and spizella simply identifies it with a few other little sparrows, it is distinctive once you take a closer look. It’s named for the sharp chip it sends out to let its mate know where it is (its call). Its song can also be described as a series of super-fast chips but a rattle, or single-noted trill is more precise. Those in the know claim that males who have staked territories near one another impressively develop their one repeated note into individual songs. The Chipping Sparrow’s song sounds a lot like that of a Dark-eyed Junco, but the sparrow’s note is repeated more quickly and is less metallic-sounding. A third sound this bird makes is an extended seep, warning of a nearby hawk or other predator. The Chipping Sparrow shouldn’t really even qualify as an LBJ since once it turns around, or you can see it from below, its smooth, pale grey breast, along with the dramatic black eye-line accented by a white eyebrow are giveaways. Its orangey-pink legs and feet are also characteristic. Migration takes this bird from far north of here in the Canadian sub-arctic all the way south as far as Nicaragua in the winter, where its bright rufus cap fades a bit and as if taking a tan, its breast and belly become a little darker. Fairly solitary during the breeding season, afterwards these birds form loose groups intriguingly known as a tournament. Males are quite territorial and will guard their lifetime mate as she builds her flimsy nest and incubates the eggs. Although light can be seen through the loose weave, she indulges her future nestlings with a soft lining of hair or fur. Chipping Sparrows were once known as “Hair Birds” for this reason. Although quite adaptable when it comes to the location for her nest, she prefers conifers (wild or ornamental) and usually builds among thick foliage at the ends of branches not more than 10′ from the ground. Like many other birds, the female develops a fluid-filled bare patch on her abdomen during breeding season that helps to keep her eggs warm during incubation. Seeds and small insects form most of the Chipping Sparrows diet. 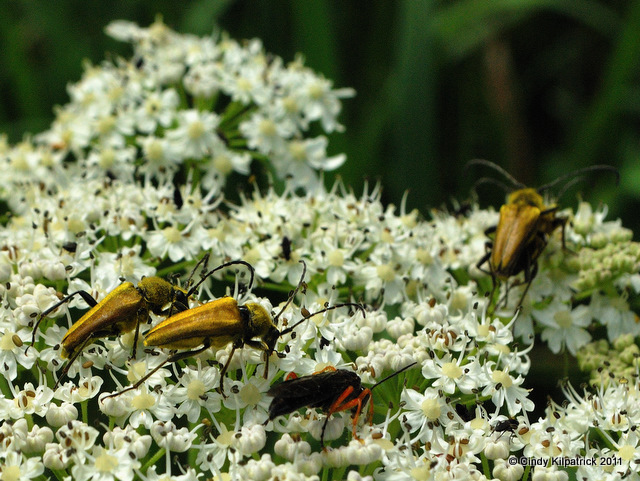 It will readily visit backyard feeders where it pays for its dinner by picking off some of the mosquitoes and flies. The first pictures this year of the Northern Shovelers on the marsh near my work were taken on May 21. Two pair, or at least 2 males and 2 females floated, paddled and mostly put their heads down like a snow-plow’s bucket and skimmed the water beneath the surface for nourishment. As dabblers, Northern Shovelers feed on any little animal or vegetative matter they find in shallow water and prefer marshes like the small wetland I visit most days. Their enormous, spoon-like bill and comb-like projections on the tongue give them the advantage of being able to strain small invertebrates from the mud at the pond’s bottom. The scientific species name clypeata means ‘furnished with a shield’ referring to this duck’s unique bill. At first it wasn’t obvious that these ducks are monogamous. The four of them seemed quite content to dabble together, but within days it was clear that my little marsh might not be large enough for them all as at least one male would spring from the water towards the other whenever he came too close to his mate. Rising in a rush like a spring, he cut a low, direct path to the intruder, briefly scolding him, “took, took, took”, in his restrained but obviously effective way. Then circling to return and skim the water, with one strong wing stroke he would come to a skidding stop close to his mate. It was comical to see how quickly he would return to feeding as it was all in a day’s work. Returning from a short flight to warn away another male, a Northern Shoveler skids to a stop with his powerful wings. Other ducks and even the resident muskrat don’t give him a moment’s pause. I often saw the Shovelers sleeping or preening on a raised mound of muskrat-mud with the much smaller green-winged teal, or sometimes a blue-winged teal close at hand. Unconcerned, a male Northern Shoveler preens himself while a much smaller male Green-Winged Teal swims near his mate. Floating, sitting or standing – bright orange legs and feet displayed – the female seemed to be always either feeding or sleeping. The male, in contrast, appears to spend the majority of his time preening himself. Perhaps that’s how he entertains himself while keeping watch. While his mate sleeps with her head tucked up in her wing, a male Northern Shoveler preens himself. Almost as large as the Mallard, with a wing span of nearly a metre and a similarly coloured, iridescent green head and neck, the fairly common Northern Shoveler is often at first confused with this ubiquitous duck. The morning light shows the iridescent green head and chestnut-coloured sides of the Northern Shoveler, reminiscent of the Mallard. However identification can be clarified by the massive bill, yellow eyes and white chest. A closer look will end the confusion. As the marsh vegetation grows, it becomes more and more difficult to see the residents but the male Northern Shoveler often stands out with its yellow eyes, bright white breast and belly, and rufous chestnut sides, a fleeting sparkle in the reeds. A ‘channel’ through the marsh reveals the eye-shaped identifying pattern of the male Northern Shoveler. The female in contrast, as most female ducks do, blends in well with the vegetation and its reflection in the water with the dappled-looking chevron pattern of her back and wing feathers. I look for her huge yellow-orange rimmed bill shining in the sunlight. The Northern Shoveler’s profile is the give-away. A cloudy sky deadens reflections that normally help camouflage the unique silhouette of the Northern Shoveler as she rests on a clump of mud and grass. Now I believe they are nesting. The marsh is quiet. The female should be sitting on eggs in a nest hidden in the thickest vegetation, purportedly away from the water. It’s getting more and more difficult to discern whether there are still two pair in residence. If there are, they are staying well clear of each other as I only occasionally see a lone male to reassure me that they’re still around. An aggressive defender of his mate and territory while breeding, the male Northern Shoveler often abandons the family during incubation. I’m very curious to find their nest since the little wetland is bordered by a thin strip of conifer forest rising right into town. Northern Shovelers are said to nest 75-200 feet from water. If that’s the case, although I am a poor judge of distance, I’d say they’re into the well-worn forest very close to industrial on one side (including an oil well) and residential lots on the other. Northern Shovelers are monogamous, often returning to the same breeding and nesting areas between their long migrations as far as the west coast of Mexico. 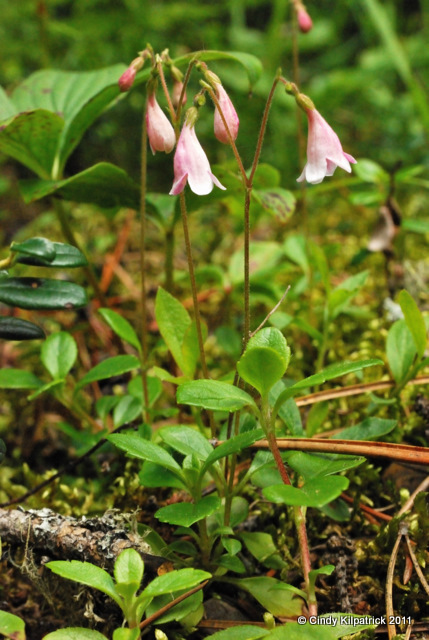 Delicate and diminutive, this distinctive member of the honeysuckle family grows with the moss among lingonberry and bunchberry. 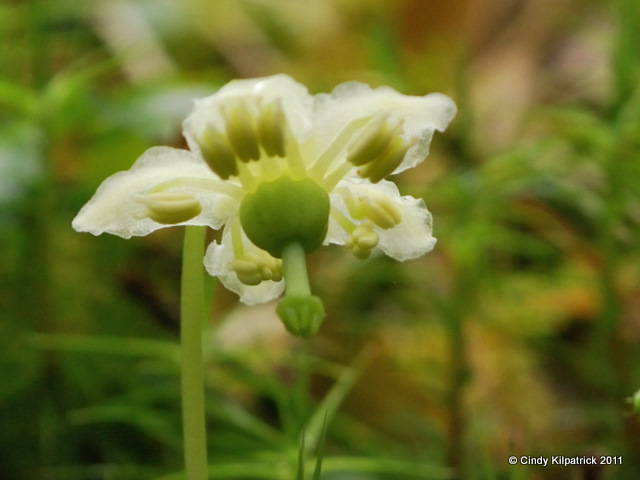 It spreads along the forest floor on lacy vines, sending up clonal shoots at intervals.The Dena’ina name for this sweetly fragrant plant is “k’ela tl’lia” or “mouse’s rope”, a fitting description of the meandering vines depicted well on this page. 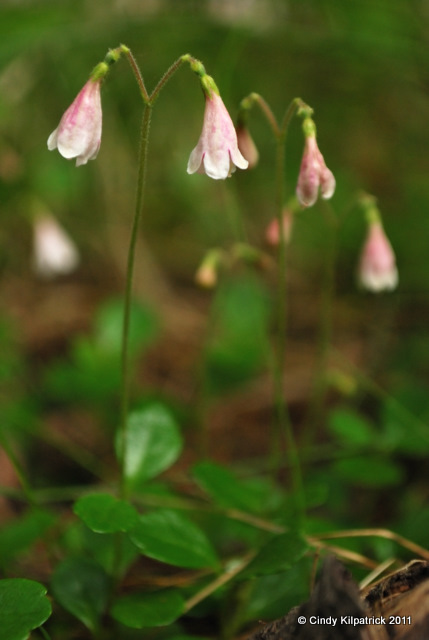 Blooming in the early to mid-summer, the elegant twinflower was used by First Nations people for a calming and healing tea. It likes partly shaded areas where the moss is moist and the shed evergreen needles acidify the humus somewhat. Which breathes his sweet fame through the northern bowers. 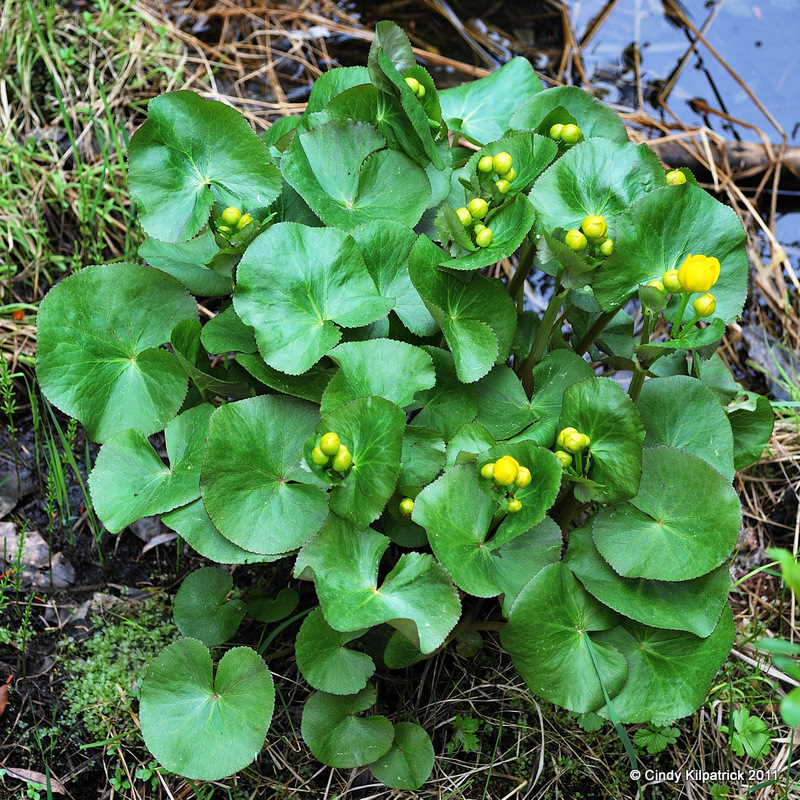 While so many of our spring flowers are miniscule, the Marsh Marigold is a delight to discover in an open area by a sluggish stream. The plant itself is brilliant and showy with its large waxy leaves. Many a bowl of reassuring freshness has adorned spring tables through freezing nights and late snows. It’s so scrumptious looking that you might be tempted to take a bite…but don’t! This entire plant is poisonous. It is toxic to the heart and can cause inflammation of the digestive organs. Handling the leaves can cause the skin to blister. The poison is volatile however and dried or cooked it is rendered harmless. 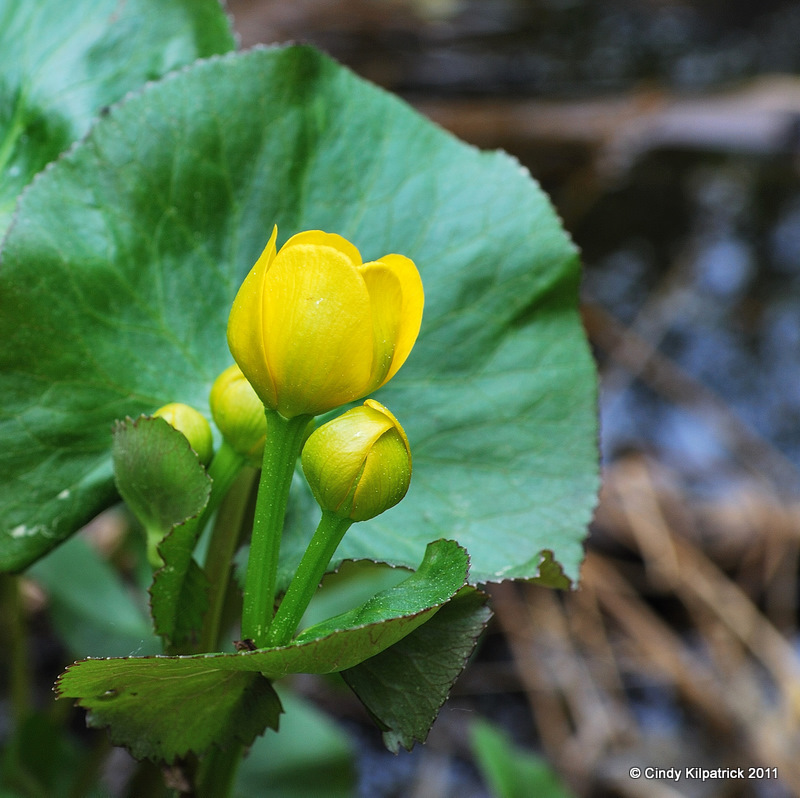 The spring blossoms of the marsh marigold have long been appreciated for their early colour. Like earthbound sunshine, patches of brilliant yellow set among shining green rise from brown and crumpled grasses in boggy roadside ditches and fens in early to mid June, as if beckoning returning waterfowl to potential, if not ideal nesting sites. A polymorphic species, it occurs throughout the northern hemisphere in varied forms and goes by many names, most of which celebrate its welcome as a beautiful harbinger of spring. ‘Marigold’, used now over much of the modern english-speaking world, originated with Anglo-saxon celebrants of Easter, who gave the name to honour the Christian St. Mary. 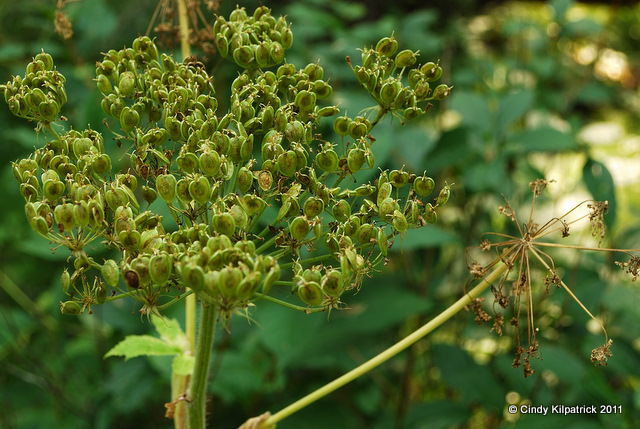 By the end of July the waxy blossoms have done their work and the stellate seed clusters adorn the softened, but still handsome mound of leaves. 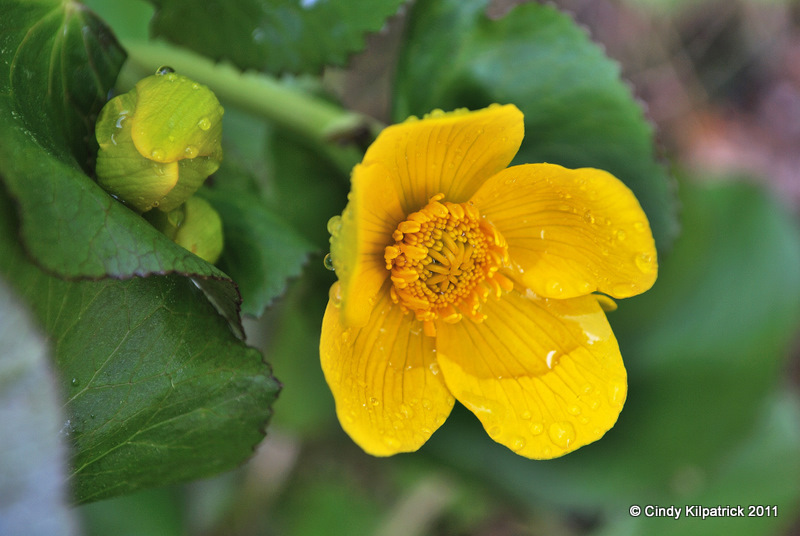 Depending on the source, the genus name ‘Caltha’ may refer to the colour or to the cup shape of the opening blossoms. 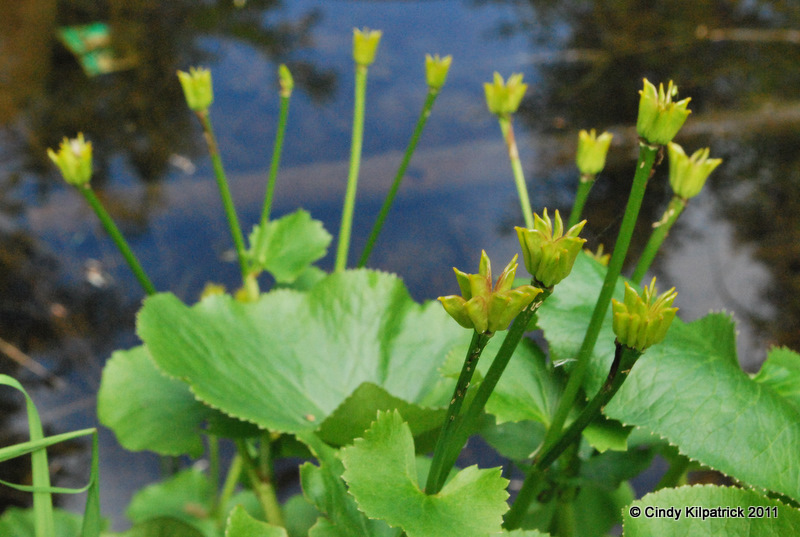 Its species name, ‘palustris’, meaning ‘of the marsh’, clearly describes its habitat. 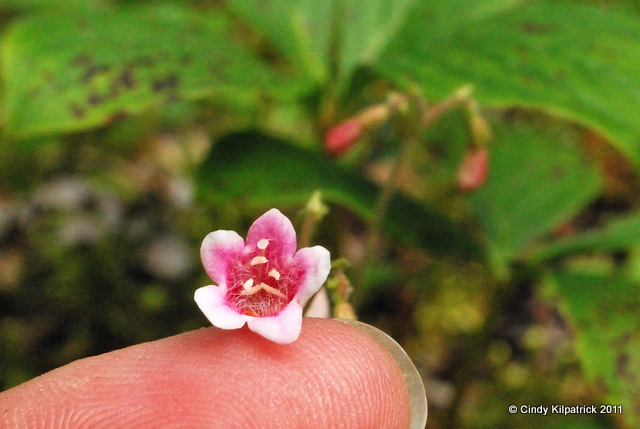 Until I began to research this sweet jewel, I did not know that one of its common names is ‘woodnymph’. 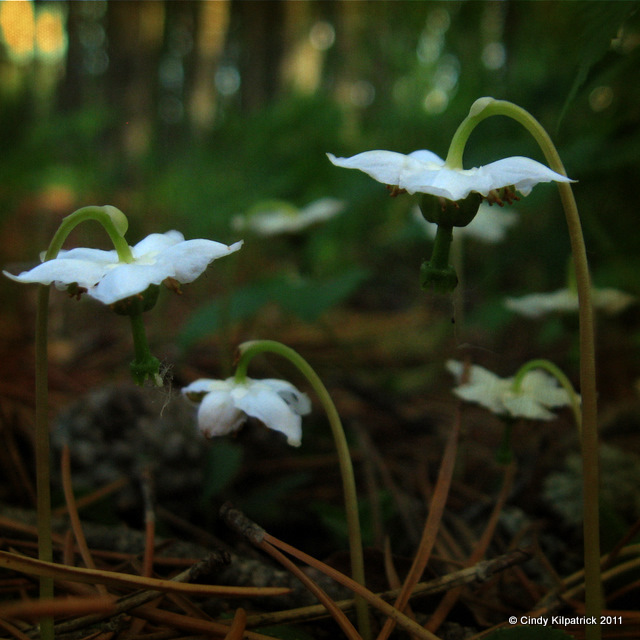 How fitting, as like tiny waxen lanterns under the evergreens, the one-flowered wintergreen shine with soft luminescence. 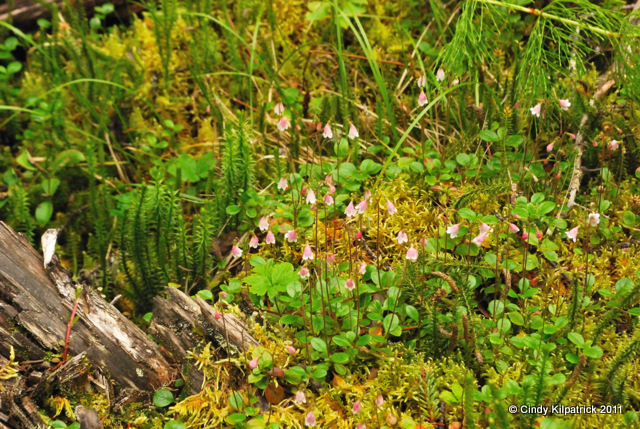 It is not difficult to imagine them dancing capriciously through the deep mosses when not observed by lesser mortals. Another of its common names speaks to its habit of keeping its head bowed until mature. The shy maiden hides its beautiful face, providing shelter for visiting bees whose wings collect and deposit pollen in a process known as buzz-pollination. 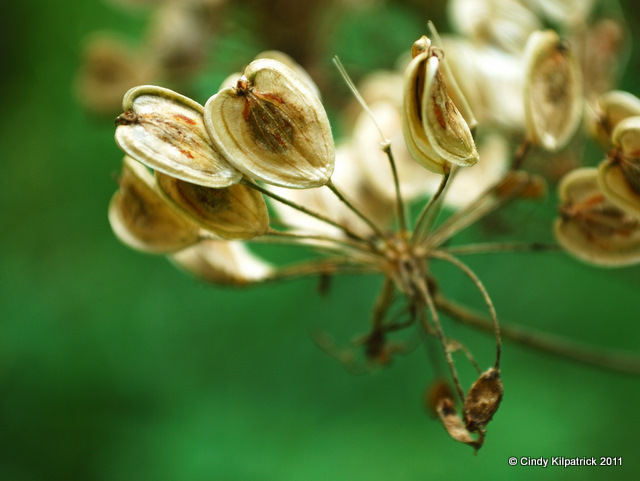 After fertilization, the scapose (leafless) stem straightens, the petals fall off and the crowned fruit begins to form. 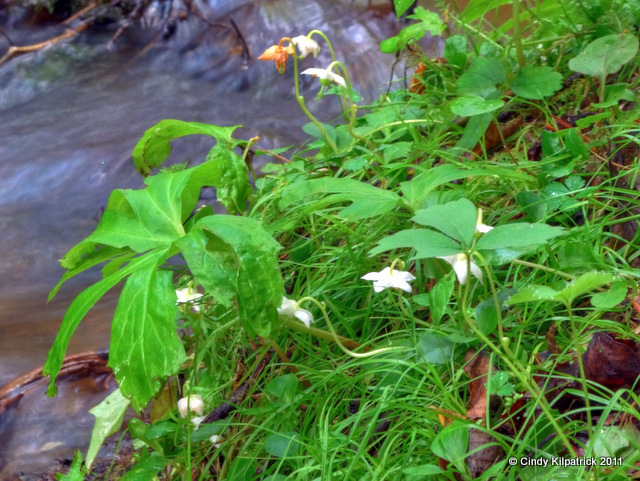 Like many native species, the one-flowered wintergreen depends on particular fungus occurring in the moist, humus-rich forest floor just as the pine and spruce provide required shade. Although it is globally abundant throughout boreal habitats, collection and forest harvest have caused its decline in some regions. 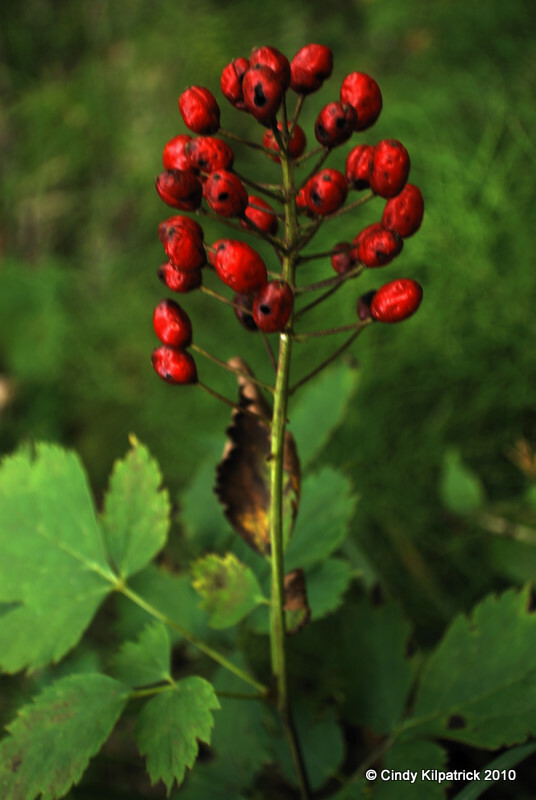 It is reputed to be edible, high in Vitamin C and effective in the treatment of some skin problems. In recent years it was discovered to contain a new antibiotic. 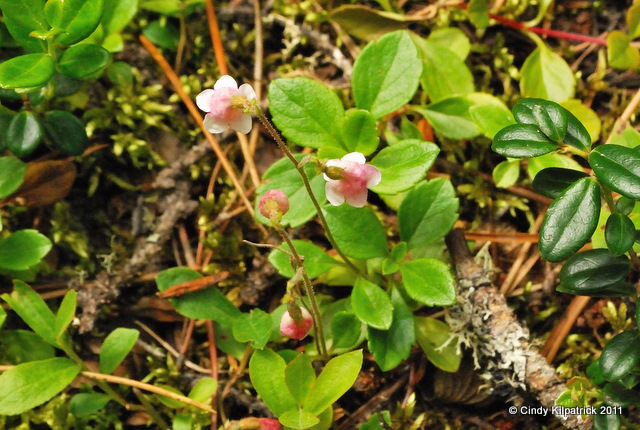 Although the one-flowered wintergreen was originally grouped with others in the wintergreen family, it was distinguished in 1843 by Thomas Nutall to Moneses, a monotypic species. “Asa Gray gave it its present name in 1848. 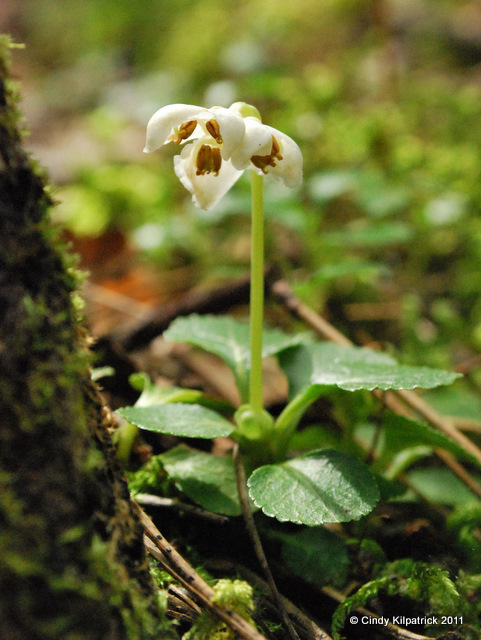 “Moneses” is a combination of the Greek “monos” (“one”) and “hesis” (“delight”).” (1) “Uniflora” refers to its lone blossom. And delightful it is. Recline on the mossy bed. Lay your head next to this shy maiden to gaze into the surprisingly compelling face of intricate beauty. Then close your eyes and inhale the delicate perfume. You too may become enchanted. 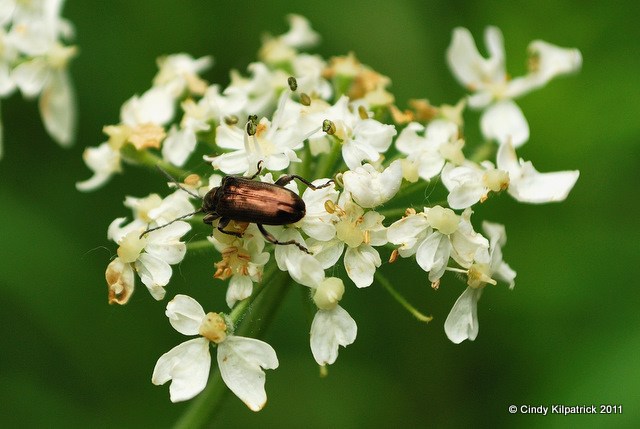 According to Botanary, this genus of the carrot family was named for Hercules, who was supposed to have used it first for medicine. 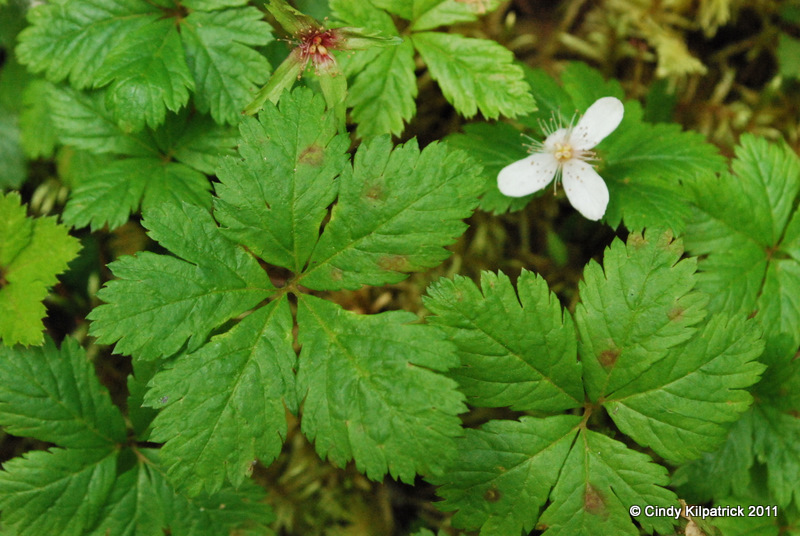 This odoriferous species is indeed a plant of muscle: important and commanding as probably the largest perennial in our forest. 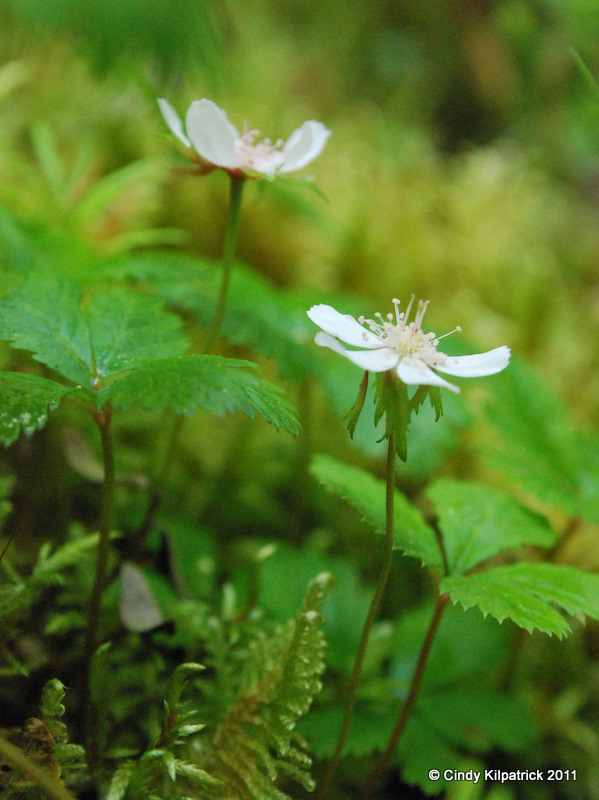 It grows in rich moist soil in broad and small forest clearings, rising up to almost two metres by July. Its huge, 30 cm. 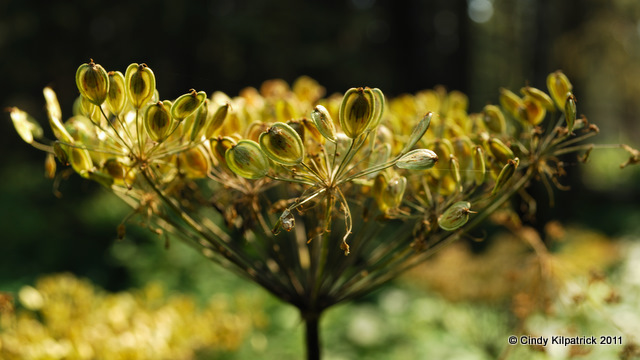 compound hairy (lanatus) leaves and equally large flower heads provide landing plantforms and important sustinence for a wide range of insects and birds. 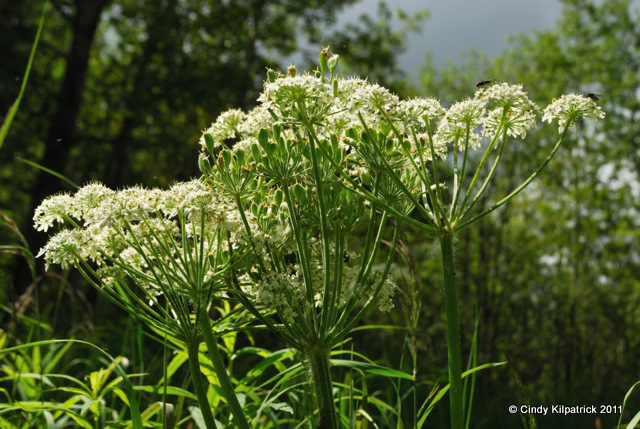 In contradiction to its name and in spite its nutritious foliage, Cow Parsnip is often shunned by cattle and can apparently have a souring effect on their milk when they do eat it. Bears have apparently been known to browse on the flower heads in the spring and in the fall the winged, sunflower-like seeds are popular with birds. 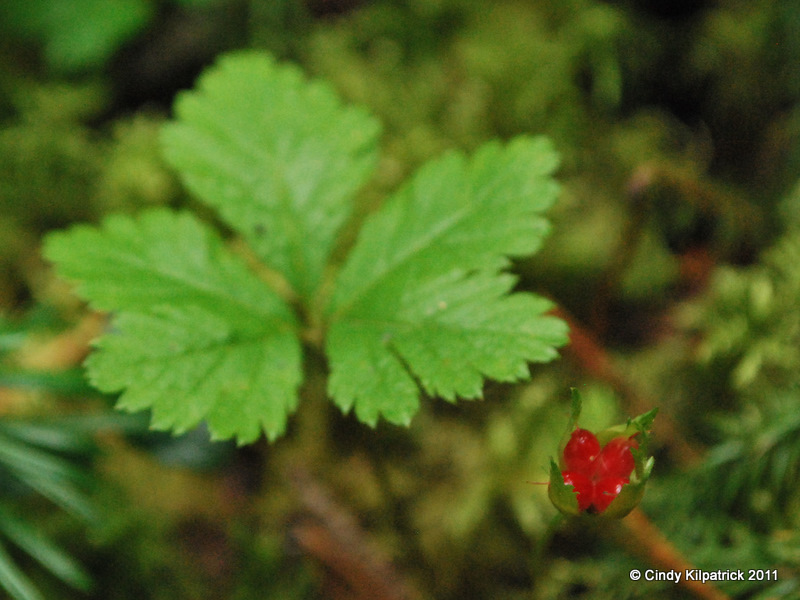 After the frost, deer, elk, bears and marmots will eat the stems and leaves. 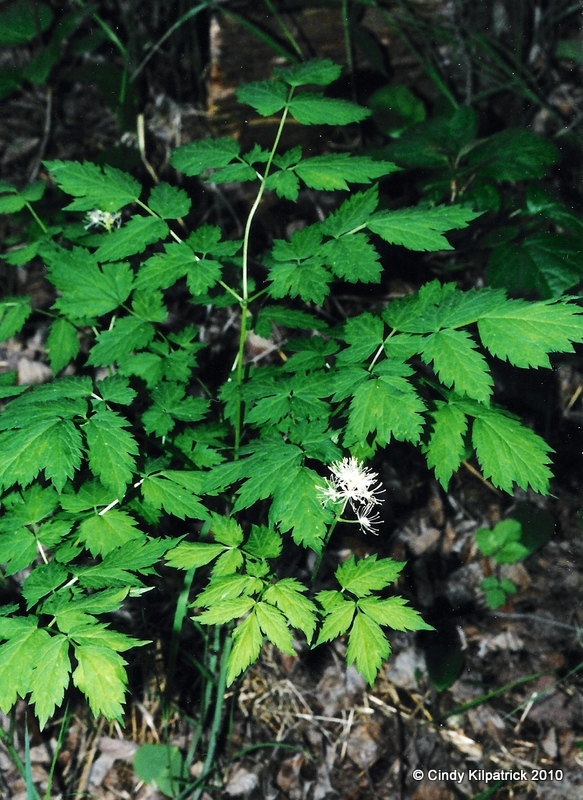 Roots, young leaf stalks and marrow from the hollow stem were used as food, for rituals, as a yellow dye and medicinally by the North American First Nations and early Europeans although care was taken as sensitive skin can be affected a phototoxin contained in the roots and outer skin. 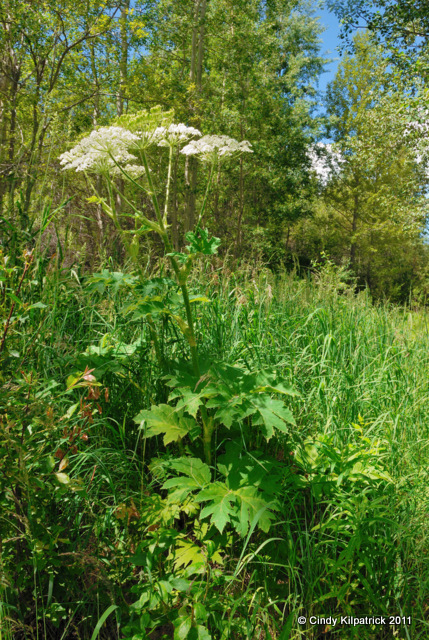 If you are going to handle Cow Parsnip for any reason it is important that you do not confuse it with other plants of the carrot family that are quite poisonous. Gavan P.L. Watson from Ontario has a good description of the differences here. 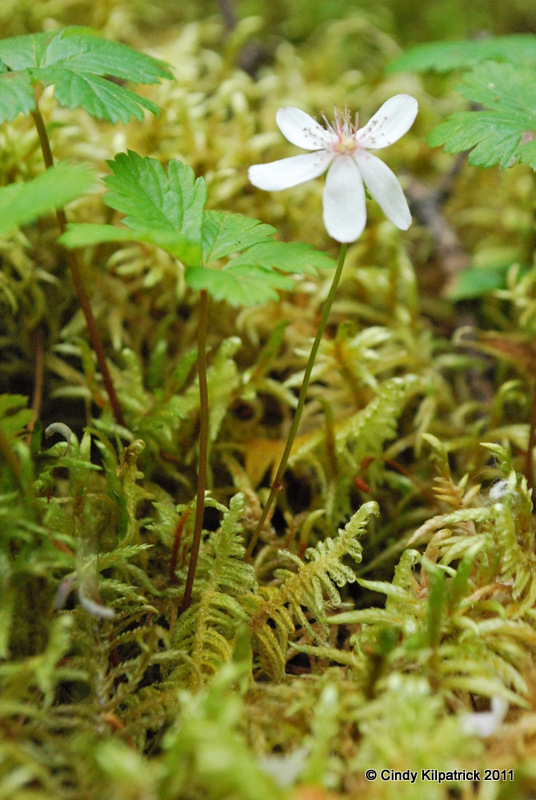 I’m the kind of person that can have an engaging conversation with you and not be able to tell somebody later what you were wearing, so it was especially exciting for me when I noticed this little plant in a small deep-moss clearing. It’s not so much that I’d never seen it before, it’s that I’d never really seen it! 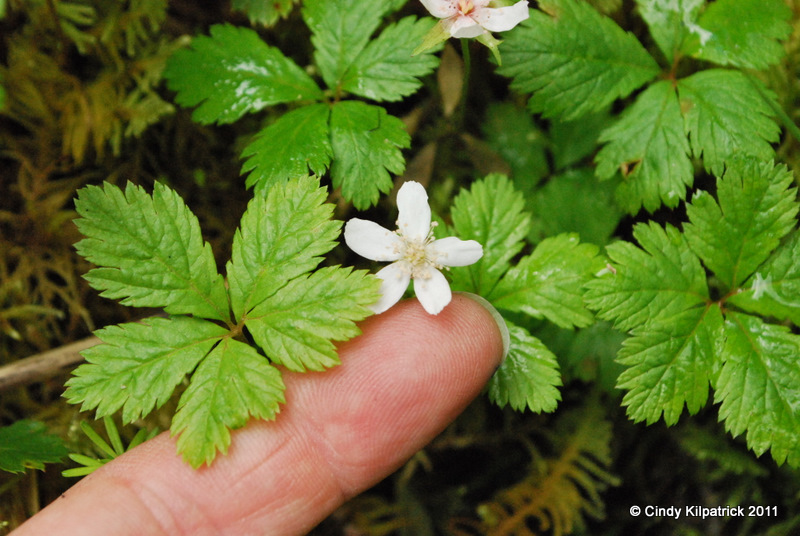 Perhaps I had never seen it in bloom and may have mistaken its foliage for that of one of its cousins, the Dwarf Raspberry. 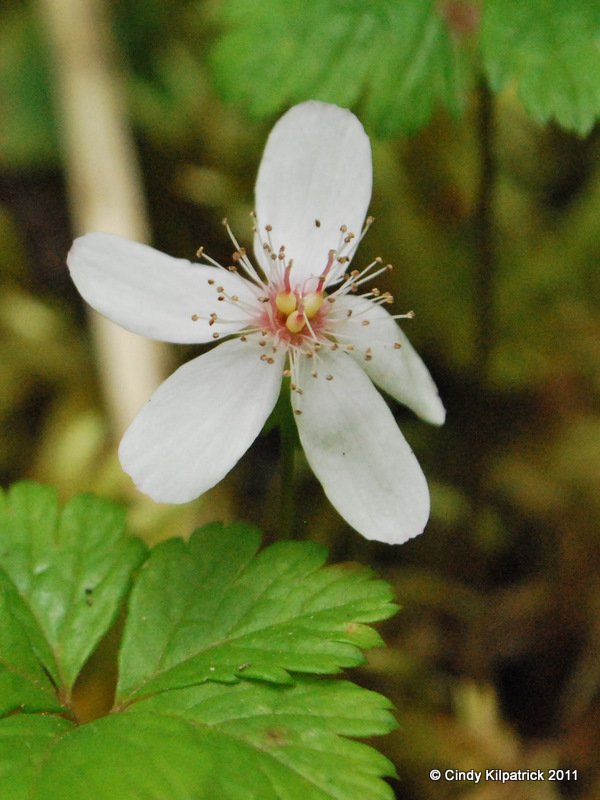 In bloom I might have assumed that it was another relative, the Wild Strawberry. It’s very tiny. 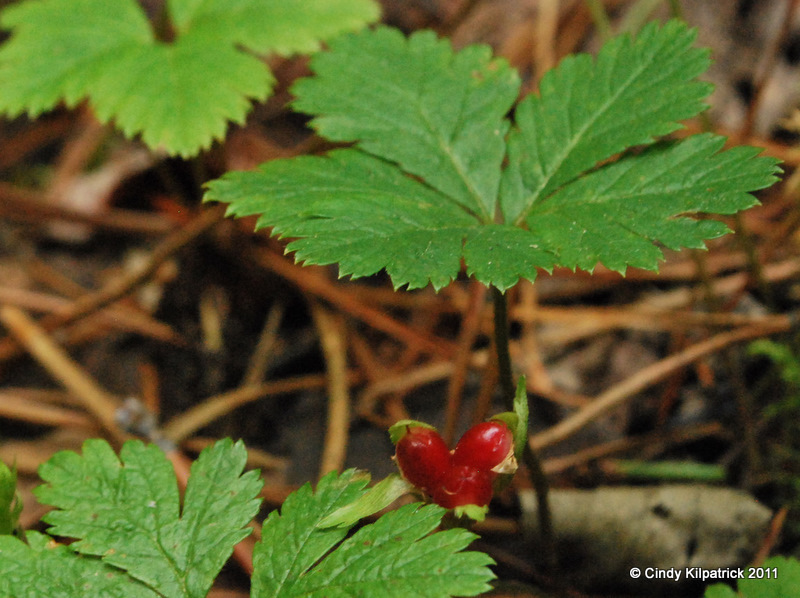 A closer look reveals that this flower is quite different from a strawberry’s. 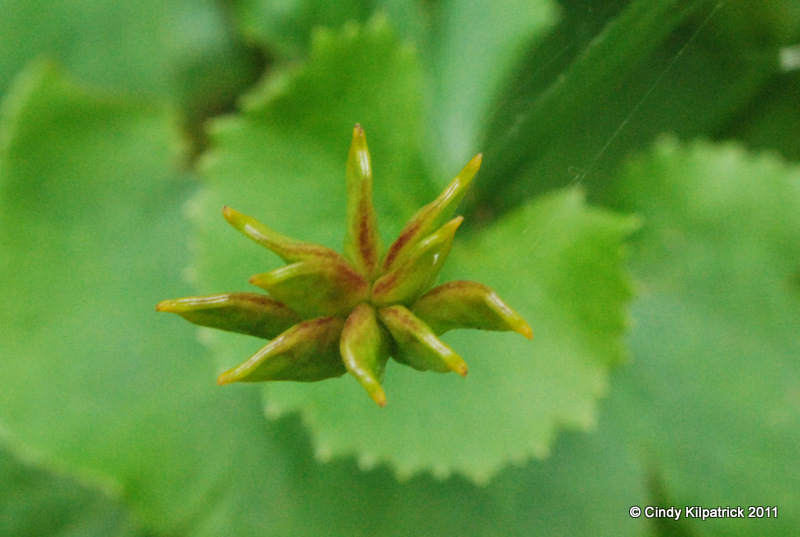 The petals are more elongated and the centre was different. 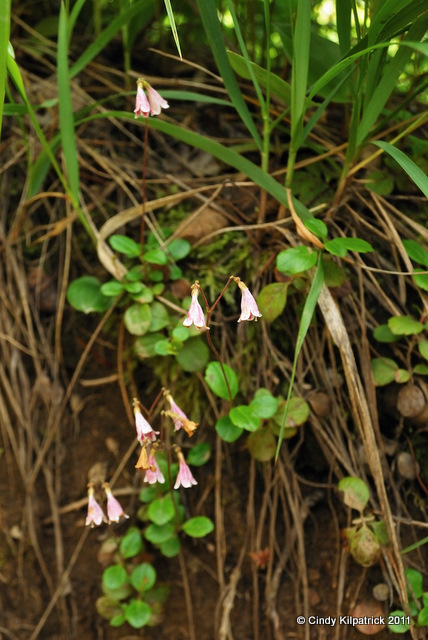 It had three very distinct superior ovaries with styles that turn pink along with the base of the petals and sepals as the flower matures. The sepals are drooping at first, as you can see in the top picture and then in more mature blooms raised level below the petals. As the petals fall off it seems they continue to rise to enclose the fruit. 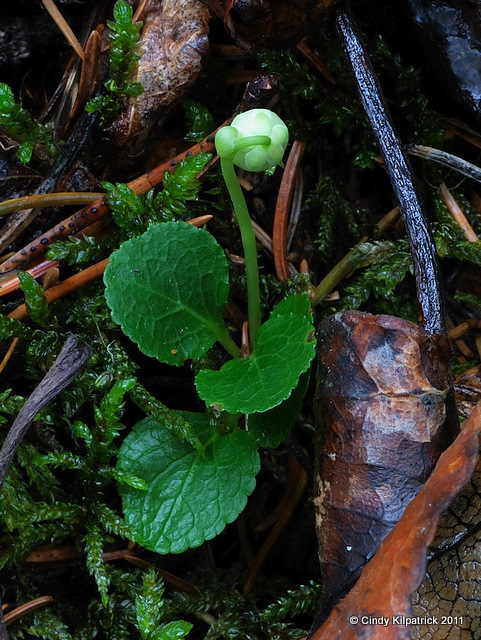 Single leaf and flower stalk emerge separately from the moss, about 5-7 centimetres high. The leaves were different as well. At first I thought it had five leaflets on its palmately divided leaf, but the side leaflets are just so deeply cleft that there are actually only three. Apparently the number of ovaries can vary as the fruit can have from 1-6 drupelets. I had a really hard time identifying this plant. I couldn’t find it in any of my books, or through Internet searching so I posted it to a couple of groups on Flickr that help with this kind of thing. The following day I was very grateful to receive a positive ID from Tiggrx. 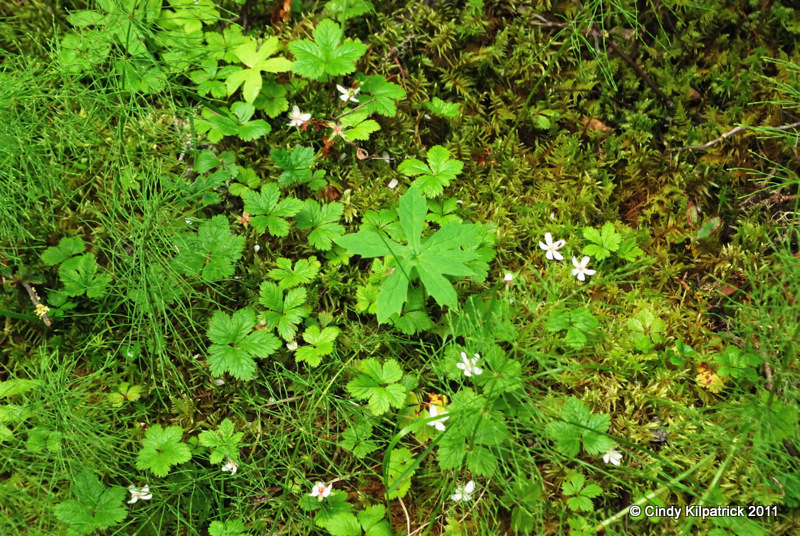 I later found it in Wildflowers of Alberta by R.G.H. Cormack (Hurtig 1977) as a note within the description for the Dewberry. 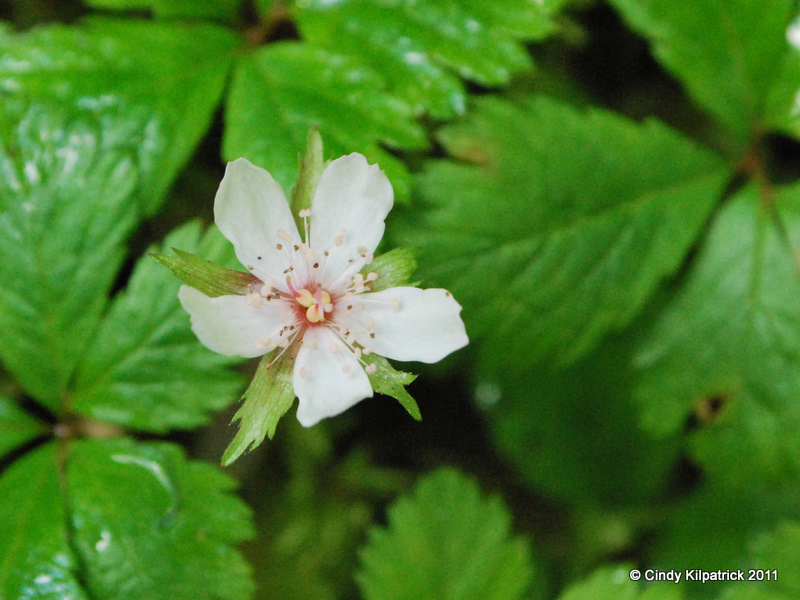 There are literally hundreds of plants in the Rubus genus, which it is believed has survived for some 36,000 years and exists on all continents except Antarctica. This little treasure is just another little sibling in the family and I don’t know how long I’ve been rudely ignoring it. It is a beauty. 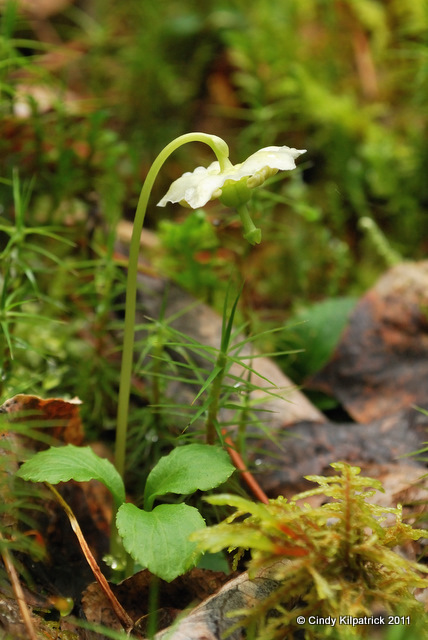 It fully deserves the risk of getting a little damp as you lay down in the soft deep moss to spend some time getting to know it better. Many thanks to Tiggrx for identifying this plant for me. An attempt to cross the highway with its prey was thwarted as we pulled over to take in the rare sight. An Internet search on the word ‘lynx’ returns nearly 42 million hits. The animal appears to be (justly) idolized. It is everywhere a popular choice for commercial and website names. Lynx appears in Greek myths and even early astronomers admired this predator. In all the many myths and lore around the lynx, its exceptional vision appears to be its most revered characteristic. One who has the good fortune to have the solitary lynx ‘walk beside’ as their spiritual totem will “…have an uncanny ability to recognize the fears, secrets, agenda and feelings of guilt or remorse that are all but invisible to most other souls.” (Source) As a silent watcher and listener, Lynx will this keep knowledge close and not share it, unless specifically asked. It is by watching with its keen night vision and by listening with its oversized ears, that the lynx finds and stalks its primary prey, the Snowshoe Hare. Silently padding on its huge, thickly furred feet or waiting in hiding, the lynx will suddenly spring: its long, powerful hind legs carrying its metre-long, 30-pound body a distance of over 6 metres with one bound. 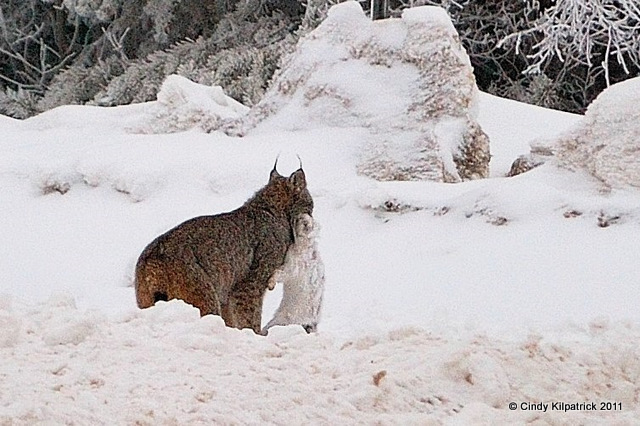 Lynx may be hunted by wolves, cougars and coyotes, which also compete with it for food. The lynx, though, has a distinct advantage over its predator enemies in its huge, furred and splayed feet, which ‘float’ over deep snow, taking it into hare habitat much more quickly and efficiently. 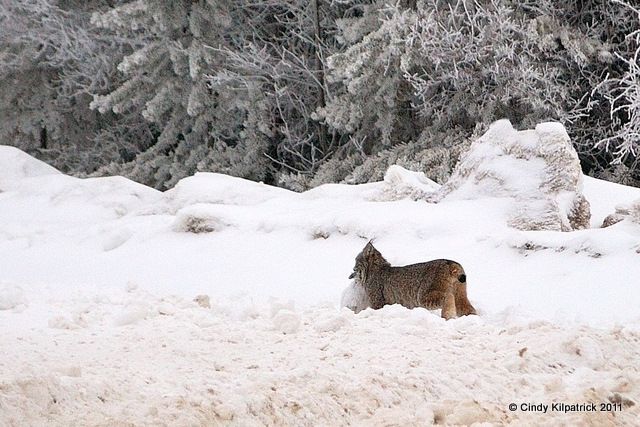 Click here for an amazing image of a Canada Lynx in the Yukon by Keith Williams. Lynx will hunt squirrels and other rodents, birds, especially grouse and even occasionally a young or injured ungulate, but snowshoe hares make up 75% of its diet. Indeed, there is a direct correlation between the 10-year cycle of abundance and decline in hare populations, and numbers and range of lynx. Where the hare goes, so will the lynx. Anything that affects the loss of hare habitat (Please see my article on the Snowshoe Hare) will directly influence lynx success as well. Depending almost solely on the population densities of hare, the territorial lynx requires an individual range of 15 – 47 square kilometres (source). 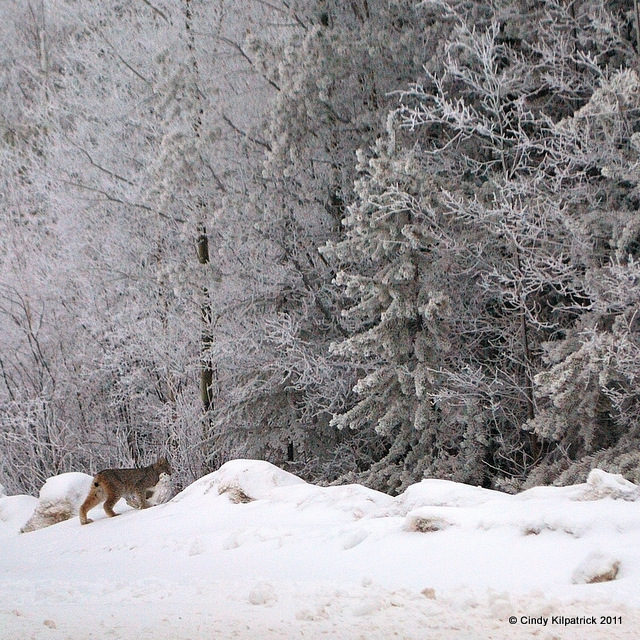 It is thought that female lynx may require old-growth forest to shelter and hide her young. Trapping can also be a threat. In the early days of Canada’s fur trade, the lynx or le pichu (from the Cree peshewa), was nearly wiped out. Numbers hit serious lows again in the mid 1900’s when pelt prices reached $1000. Even though restrictions and quotas have since been implemented to ensure the species’ survival, lynx have been extirpated from the southern-most reaches of their range in the United States. In the region where I live in Alberta, where lynx are caught by leg-hold or kill traps, 6-9 animals (worth about $116 each) can be ‘harvested’ by each registered trapper. Alberta’s Sustainable Resource Development department bases the quotas on estimates taken every five years. It is March and the lynx will be mating. Judging by the number of tracks I have been seeing, it seems to be a good year and possibly a peak year for hares, so a predictably good year for kitten survival once the average of four are born after a two month gestation. About a decade ago I had the pleasure of watching three lynx kittens playing under a shrub by the side of the road. I will likely have only this memory to help me imagine the progeny of this season’s illusive lynx, just as my likelihood of taking better pictures of this magical creature are slim. Usually nocturnal, this Snowshoe Hare seems to have ‘come out’ early to investigate a mysterious scrape by the side of a seldom used gravel road. Perhaps fittingly as a symbol of dawn, I have not had the pleasure of seeing this nocturnal survivalist in the wintertime apart from the occasional ghostly-white flash of a home-going Snowshoe Hare crossing my path just before the sun has properly risen. For some reason it seems to be active more during the day in the summer, although seeing one is still a rare treat. In winter though, it is hard to miss evidence of this critter’s busy night-life. 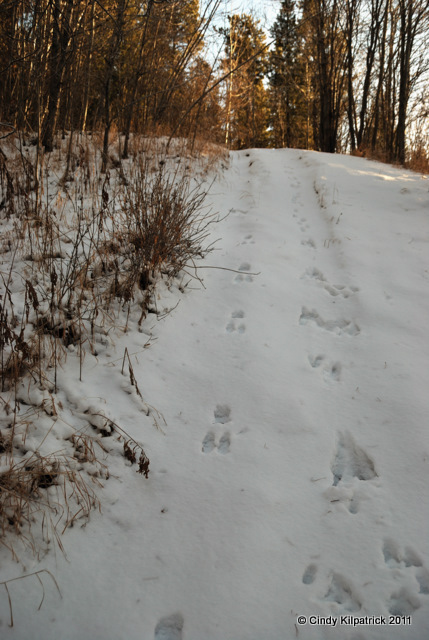 Snowshoe hares travel on well-defined paths, winter and summer. Its distinctive forked tracks run all over the forest at the edge of town where I take my walks at lunch time. Concentrating in a few specific areas of dense willows and alders with connecting trails between each patch, the night-time activities of this huge-footed grazer are exposed on the surface of the snow. Statistics collected since the early days of the Hudson’s Bay Company fur trade in Canada, show that the population density of Snowshoe Hares rise and fall on a ten-year cycle. 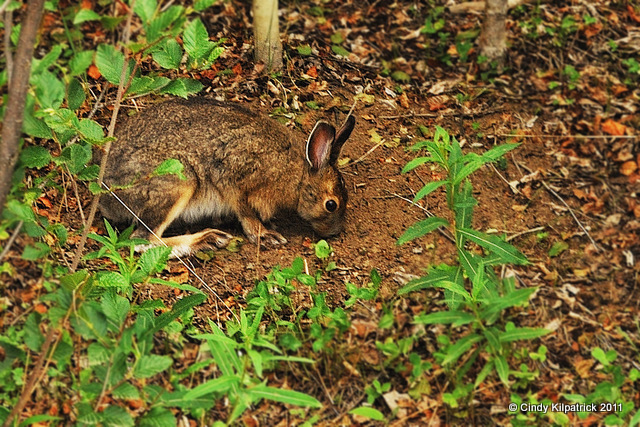 “The boreal forest is one of the great ecosystems of the earth, and the 10-year snowshoe hare cycle is one of the most striking features of this ecosystem.” (Krebs) In fact, the hare may be considered a keystone species, accounting for many creation myths around the world that feature this inobtrusive animal. In my little patch of the woods there appears to be a thriving population this year. Frequent snowfalls have shown regular and considerable nightly activity. 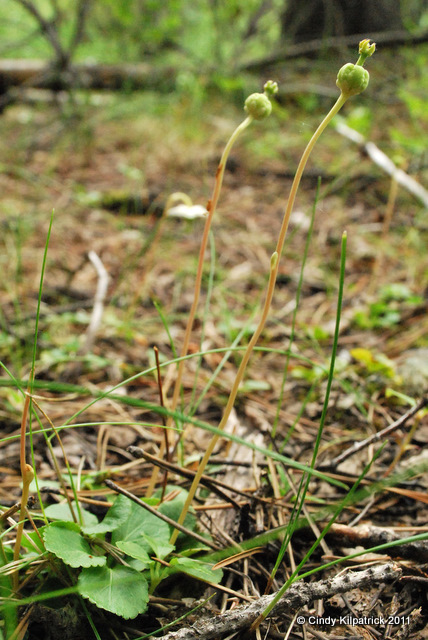 In summer the Snowshoe Hare will eat quantities (nearly the eqivalent of their own weight) of grasses, forbs and shrubs. Masterfully adapted to areas with deep winter snow, hares survive on the young twigs, bark and buds of deciduous and coniferous shrubs and trees during this long season. 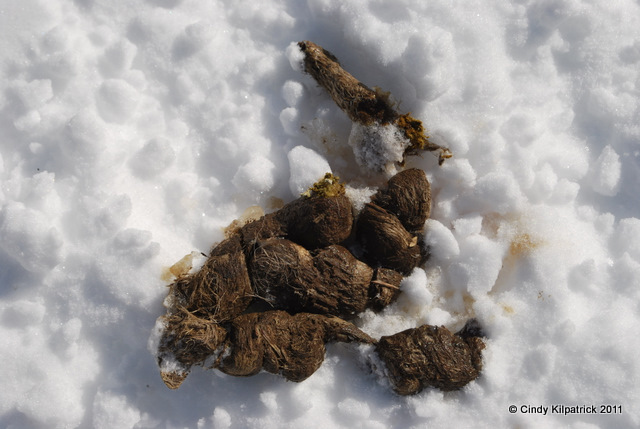 Like most herbivores, hares will not turn down a boost of protein from carrion when available, even to cannabalizing the frozen carcasses of their own kind. Tracks give away a cozy hide-away (known as a ‘form’) under a fallen tree. Triggered by the change in length of day and without consideration for the presence or absence of snow, the coat of the Snowshoe Hare begins to turn white in the middle of October. 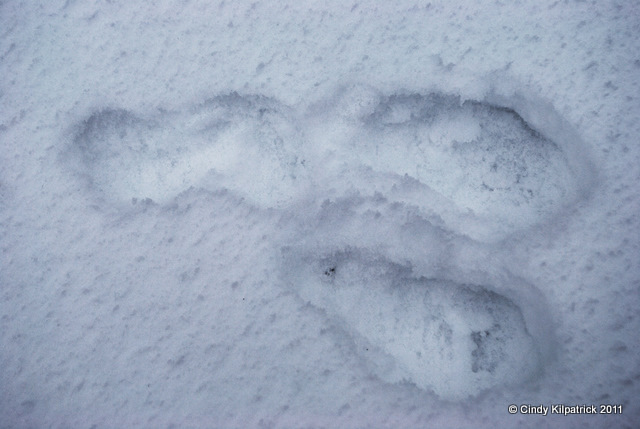 Some years there is no significant snowfall until mid-December so, loosing its usual camoflage, the hare is then extra vulnerable. 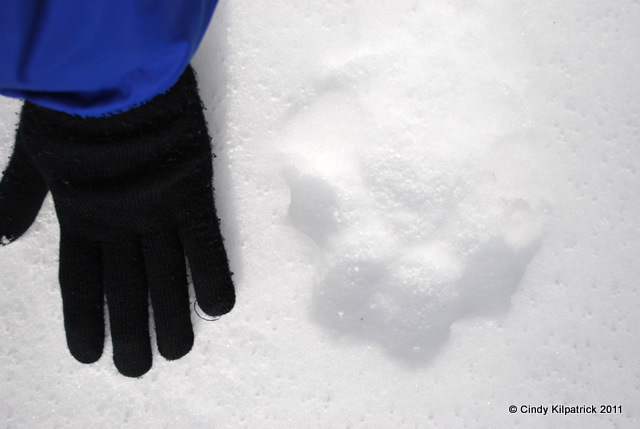 The Snowshoe Hare is hunted by nearly all predators but only the Canada Lynx equals the hare’s ability to float across the snow with large, splayed, snowshoe feet. (Please see my article on the Canada Lynx for an explanation of the deep connection between these two species.) 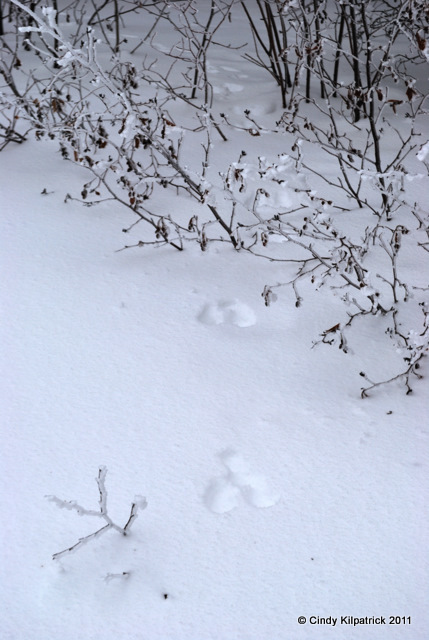 The Snowshoe Hare is a very fast and cunning runner, and a strong jumper. Exceptional hearing helps it avoid attack. Locally, nobody calls them ‘hares’ and most think of them as rabbits. Superficially, they do appear similar but hares actually belong to a separate genus: ‘Lepus’, which also includes jackrabbits. There are many differences. Snowshoe Hares tend to be larger, with larger ears and feet. They are solitary rather than communal. 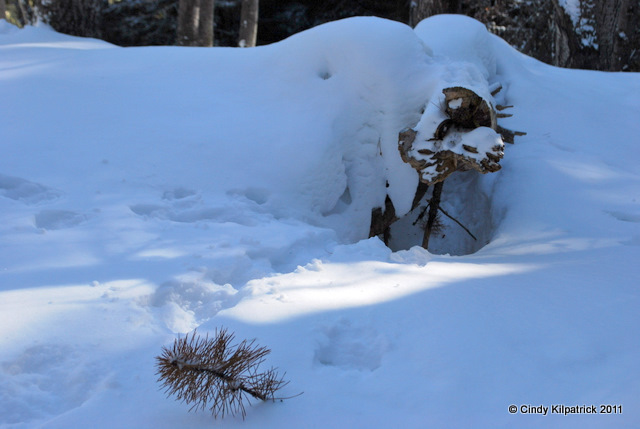 Snowshoe hares do not excavate dens as rabbits do. They take cover under the upturned roots of fallen trees, the burrows of other animals and hollow logs. 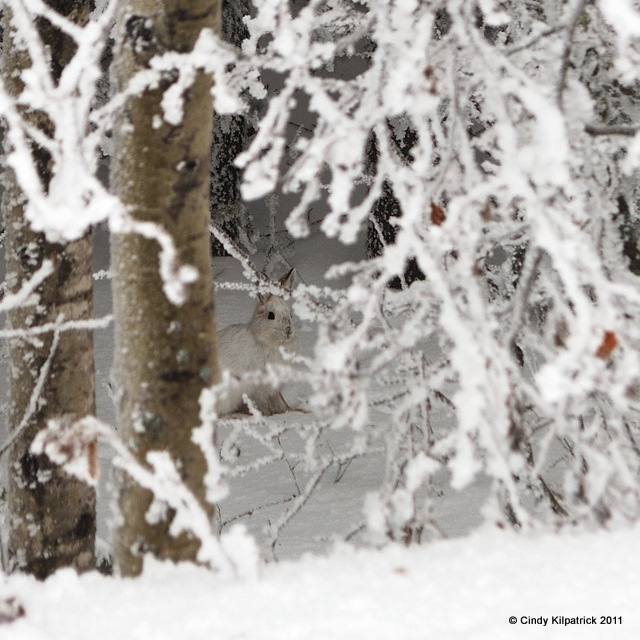 Snowshoe hares require dense scrub for protection from weather and enemies like owls. They need young pine and spruce, with its rich inner bark for substance through the winter. Although they manage in muskeg thick with swamp spruce, new woods that grow after forest fires have historically been their prime habitat. This month, Snowshoe Hares will be in the breeding mood. The phrase “Mad as a March hare” was apparently in use before Lewis Carroll gave it longevity in Alice in Wonderland. I suppose there could be somewhat of a frenzy as the fully polygamous does come into heat this month and will not be ‘ready’ again until a day after their litters are born. Newborn Showshoe Hares are called leverets and mature within 5 months of birth. The female, which is a little larger than the buck, may have up to four litters of 3-5 precocial leverets, the first born in April or May after about a 5-week gestation period. These are a little overcontrasted to show how the large back feet land in front of the little front feet, which land one in front of the other. Click to enlarge. They do say he’s a trickster! Just how far can a hare jump? Read this great old Native folktale, The Cunning Hare. 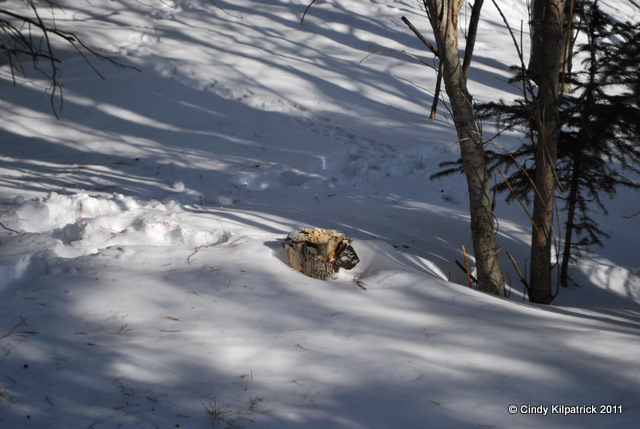 What Drives the 10-Year Cycle of the Snowshoe Hare? 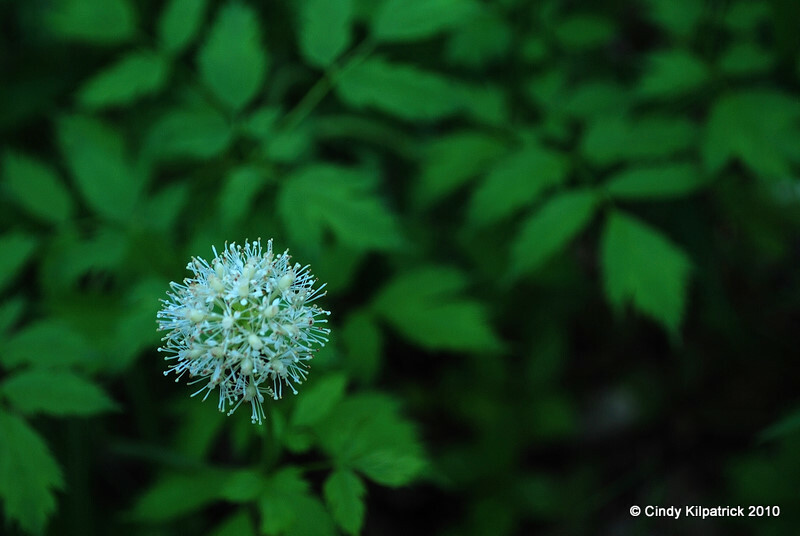 Most of the sources I’ve found say that the berries can also be white, although Ontario Wildflowers lists the white baneberry as a separate species (A. pachypoda). 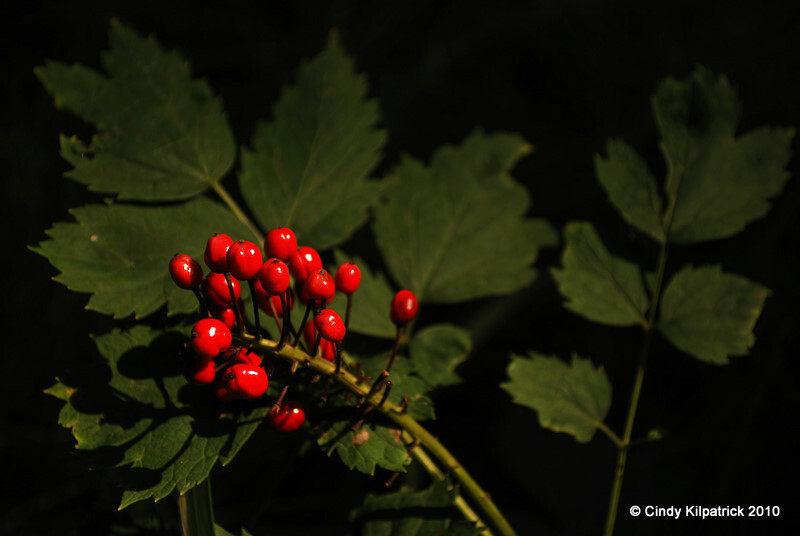 There are some good photos on that site as well, although their description of the berries of the red baneberry as ‘china white’ is a little confusing. It is apparently quite unpalatable, and there have been no reported deaths from it in North America. The European species has been linked to the deaths of children. (source) Some birds and small animals are able to digest it. I have discovered why people don't use the contact forms anymore and why their email addresses are not linkable. My inbox has become overrun by bots! So if you would like to contact me for a legitimate purpose please email me at missusk76@yahoo.com.